2014's regulations as you have undoubtedly heard from the rest of the mainstream media will change the shape of the sport for the coming years. In this series of articles I drill down a little deeper though, showing you what that means. We have heard and indeed seen how aerodynamics have been pivotal in the performance differential since the regulation shake up in 2009. 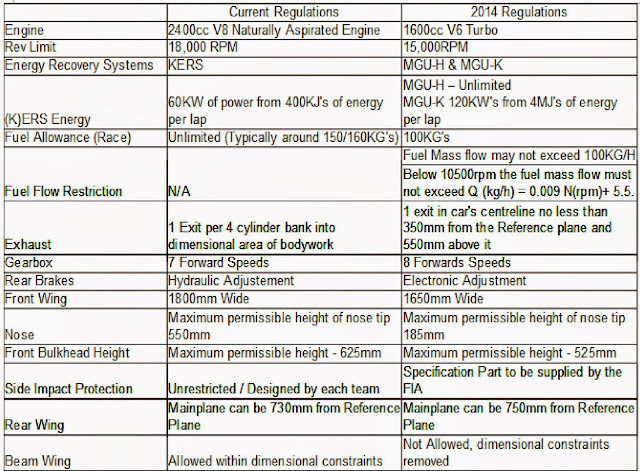 The rules that have shaped the sport since then invoked a much smaller change that the sport fully embraces this time around, where energy recovery plays a vital role in the performance of the cars too, realigning Formula One with a need to strive in all performance departments. Max Moseley's legacy as the last FIA president was championing both KERS (Kinetic Energy Recovery System) and playing a role in restraining the aerodynamacists to increase overtaking. As ever the teams found ways in which to circumnavigate the regulations and increase their performance, perhaps to the detriment of the racing. Since 2009 we have seen such break throughs as DDD (Double Deck Diffusers), F Ducts, Blown Diffusers, Flexi Front Wings, Off Throttle Blowing, DDRS (Double DRS), Coanda Exhausts etc. Proving even with the shackles on, designers will learn, innovate and regurgitate previous design elements to make gains over their rivals. 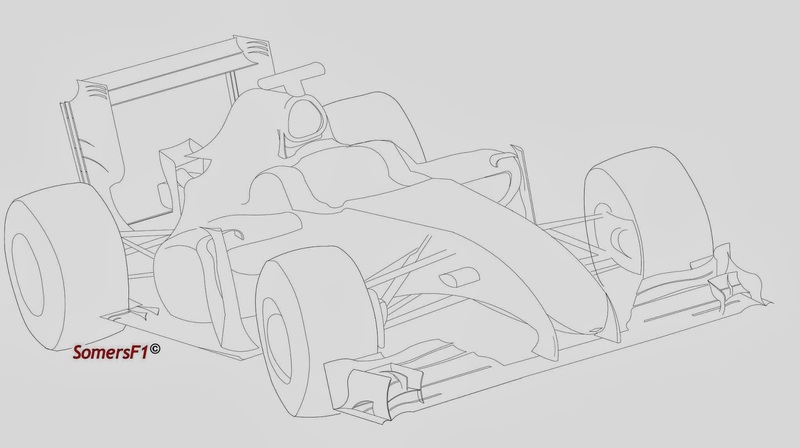 Formula One cars are essentially prototypes, never finished and always evolving, gaining around 2 seconds from lights out at the first race of the season to the checkered flag at the last and with such a monumental rule change for 2014 this could be further increased. In the basic mock up above I've tried to give you an idea of how the cars could look for 2014 but as always each team will come up with their own interpretation of the rules at hand. Over the coming articles I'll look at the most important aerodynamic aspects in more detail and see how we can use previous designs to understand what the teams may try to achieve. Over the coming weeks and months, leading to the first car launches and tests I will look at how the rules will effect different aspects of the sport including the changes to the sporting regulations. I belive your front wing design is still with the old (or actual) wide dimensions, It will be 15 cm narrower! Cheers! I've been looking forward to low noses and narrower (even if not as narrow as I'd like) front wings but I wish the rear wing was lower and wider again. I like the drawing - Red Bull have already said they're going for a "hook nose" design - I hope they're a minority in that design concept. 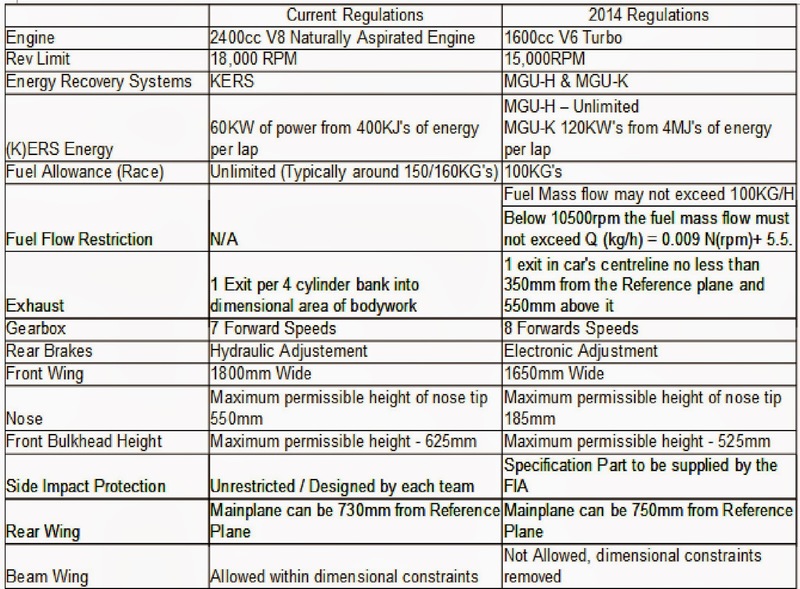 The image is simply an overview to explain the regs visually, over the next few articles I'll look a lot closer at key area's like the nose to see what the teams might be upto. I think the really interesting thing Matt is that the MGU-H is unlimited. Clearly there is some doubt about how much energy will be harvested because of the 2-way flow of energy to and from the turbo, however, given that, typically an F1 engine spends 75% of it time flat out I have assumed that in effect the turbo will run at full boost 100% of the time. Again, and I admit this is a big assumption on my part, this means that there is a 2:1 power generator to motor power ratio. The only figures I have seen for estimates in the scientific papers in terms of the maximum theoretical energy harvesting is "only" about 1 Mj. Do you have any ideas what the expected benefit of this will be? As an aside, I think the prospect of the turbo running continuously at full or near full boost is a fascinating one in terms of power delivery, and, from what I have heard, the ability to engine break the car at full boost. I cant help thinking that the cars are going to be seriously quick once all this is sorted next year. Like the look of your car Matt. Really aesthetically pleasing, why is it Newey is saying it'll be hard for cars to look good then? Hi, I just have a question about the "Fuel Allowance" values or rather units - shouldn't be kg (kilogram) instead of KG ?